Summer and especially August is an ideal period to visit Athens. During the main duration of this month, the Greeks leave town for their holidays, meaning you can have Athens walking tours around the city’s sightseeing such as Acropolis, Acropolis Museum, the Parthenon, Plaka, and Syntagma square without the queues. You can take in a show during the Hellenic Festival. Every summer in Athens, the Hellenic Festival is among the most popular events in Athens, Greece. The Hellenic Festival celebrates arts and at the Odeon of Herodes Atticus theatre, musical and dance performances are featured by international and national artists. The ancient theatre provides also a stunning venue for these kind of shows. There are also many music concerts that are held during the festival atop Lykavittos Hill and theater performances at the Ancient Theatre of Epidaurus. Do you have in mind another place to see a recreation of a Greek tragedy than in Athens? 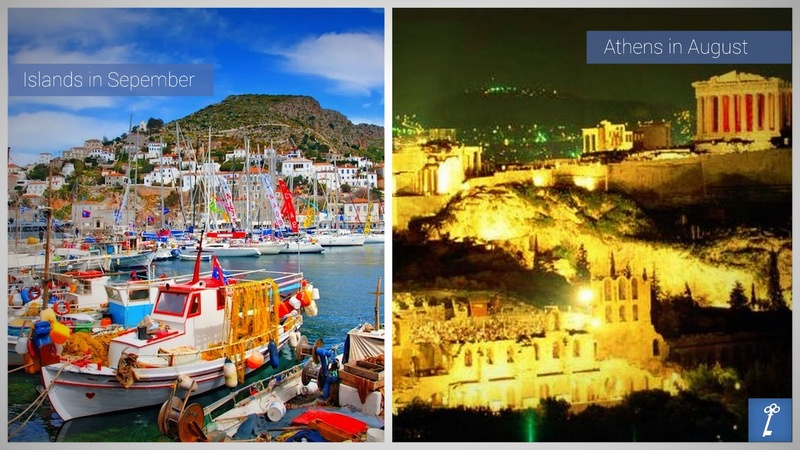 On the other hand, September is the ideal month to explore the Greek islands. The weather is perfect and the college kids are in school so it's quieter on the most popular islands. There is still some nightlife and the beaches are almost quiet in the most islands. You may get a day of rain but do not feel unlucky, there are always ways to have fun and alternatives plans that can add a little excitement. This is a time to go to the islands like Mykonos, Santorini, and Rhodes because most of the tourists are gone. On Santorini, there is the International Music Festival and a number of other cultural events which keep the island busy straight through this month. There is also the Santorini Bienniale, a celebration of food and culture. Discover Athens at its best, the islands in their peak when the water become deep blue, the sunset is dreamy and the wind blows your mind and your heart. You will not regret this short flight to paradise. Book your tour with Keytours!